The other day at lunch a friend mentioned the imminent passing of a relative who was coming up on 100 years old. From this unfortunate news we branched off to a discussion of aging and mortality. My friend said he didn't want to live to be that old, considering the low quality of life for most nonagenarians. I respected his view--one I've heard many times before--and offered my own, namely the theory that for most of us, our physical erosion is so gradual that we can adapt to working with less. Old age is a long way out in the future; barring an unforeseen illness, I see myself sticking around as long as I can. Which brought to mind one of my favorite poems these past several decades, a poem that followed me from a dramatic reading in college prep English to a prominent pushpinned spot on my dot.com era cubicle wall to this very moment. 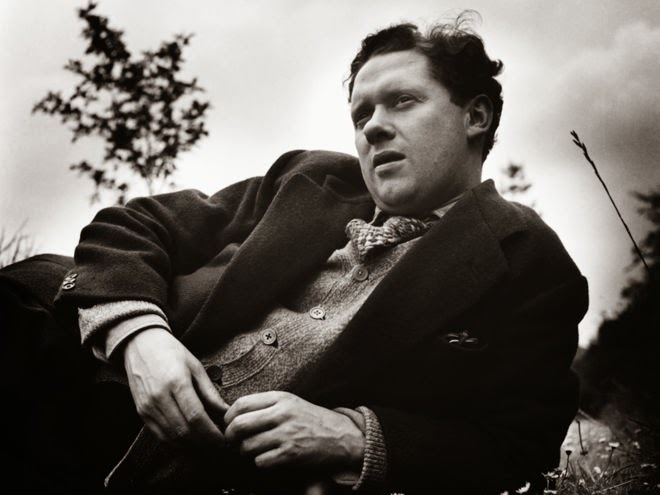 Ladies and gentlemen, Dylan Thomas. I paid $12.50 for my ticket to "Inequality for All," a new documentary about income inequality in America. The ticket, popcorn, and soda were upwards of $25. Ponying up for the occasional night out is no big deal, but it illustrates one of the major points of "Inequality for All": as my wage remains flat, everything around me gets more expensive. I can handle this type of small extravagance because I'm childless with no debt, but for working families with children, family movie night could be economically problematic. 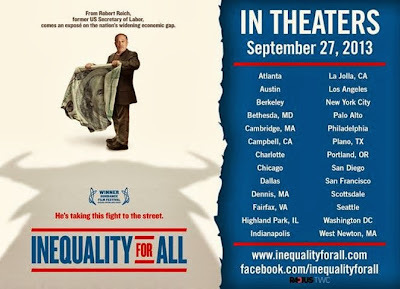 "Inequality for All" was playing at San Francisco's Metreon, a local multiplex. As people filled screening rooms to see forgettable fare such as "Runner, Runner" and "Baggage Claim," the audience for "Inequality for All"--a film of substance and import--was small. I walked in a few minutes before showtime and had my choice of seats. Most of the forty or so people spread around were academic-looking Bay Area Baby Boomers who already knew the score - I imagined trees falling in a forest. It's easy to see why escapism rules the day. Evil never sleeps, as Paul Krassner once said, and most political documentaries are exercises in impotent rage. Many people, particularly those working a stressful full-time job, would rather lose themselves in spectacle than "take their medicine" at the movie theater. 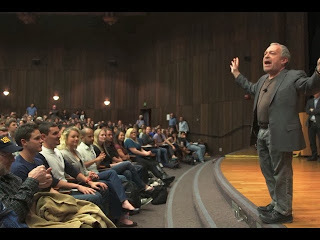 but its story is told through the warm, engaging presence of Robert Reich, the first Labor Department secretary and conscience of the Clinton Administration. 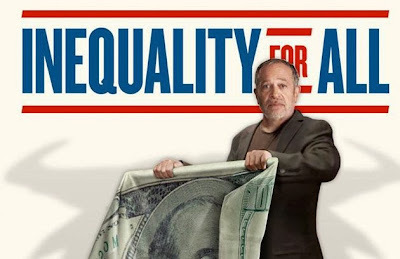 Though dead serious about income inequality (he has studied and written about the subject for decades), Reich is mild-mannered, with a good sense of humor and an underlying humanism. In a lecture in front of a big "Wealth and Poverty" class at UC-Berkeley, speeches at a Berkeley rally and a union meeting, and snippets from a one-on-one interview, Reich explains the history and causes of economic inequality without taking partisan shots. Reich is a committed capitalist who acknowledges that some degree of inequality is inevitable to reward hard work and ingenuity. But income inequality in the United States is extreme. The U.S. has the most inequality in the developed world, an income gap between rich and poor comparable to that found in Uruguay, Jamaica, and Cameroon. decline of unions and the downward pressure on pay scales brought by globalization. In 1978, the top 1% of Americans made $390,000 annually, while the average worker earned $48,000 (in today's dollars). By 2010, the average worker made just $34,000, while the median one-percenter had an income in excess of a million dollars. And the 400 richest Americans today have more money than the bottom 50%. Reich shows direct correlations between excessive CEO compensation and both inequality and economic stagnation for average Americans. The movie profiles a handful of struggling families to put a human face on the ways in which working Americans fall behind as the cost of housing, healthcare, education, and childcare rise faster than incomes. Technological change plays a role in the sluggish job market. Though Amazon.com clears a huge volume of product, it has just 60,000 employees. If Amazon's merchandise was sold merchant-by-merchant, 10-15 times that many people could be employed. Also, with capital flowing so freely across borders, opportunistic U.S. companies outsource jobs to the lowest bidder, to countries with cheap labor costs and lax regulations, in a race to the bottom. But technology isn't the only culprit; income inequality in the United States is to a large degree man-made. As Reich points out, there's no such thing as a pure free market. 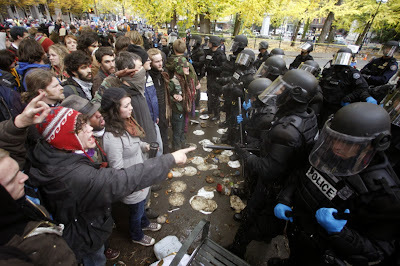 Every country regulates certain sectors of the economy and deregulates other areas. The question becomes: what rules are made, and whom do those rules benefit? breaks on investor income, many of the 1%--such as presidential candidate Mitt Romney, whose tax rate was under 14%--pay effectively lower rates than working-class Americans. Despite the stark contrast in job growth after Bill Clinton raised taxes on the rich (21,000,000 new jobs) and George W. Bush lowered taxes on the rich (-646,000 jobs), the right continues to claim that increasing taxes on the wealthy (the "job creators") will hurt economic growth. 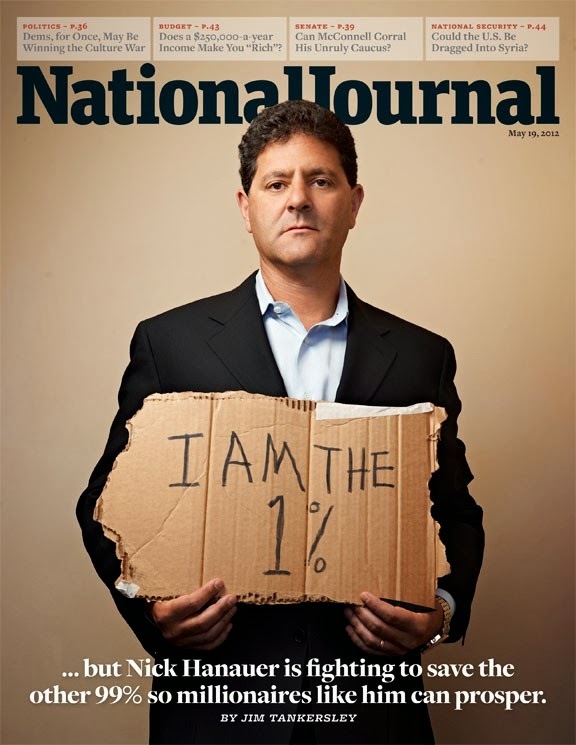 Nick Hanauer, a wildly successful and civic-minded entrepreneur, begs to differ. According to Hanauer, customers are the major job creators, as consumer spending is 70% of the economy. While a representative member of the 1% has 30 times the income of the average American, they often own just one or two cars, one or two houses, etc. The bulk of their money doesn't generate any economic activity; it sits in investment accounts, what Hanauer refers to as "underutilized capacity." employed, they have money. When they have money, they buy goods. When they buy goods, jobs are created to meet consumer demand. When jobs are created, those new employees spend money too. The heightened economic activity increases tax revenue, which enables the government to invest in education, producing a better-educated, higher-paid job force, and so on, in a virtuous cycle. Government policy in '50s America provides a sharp contrast to our Social Darwinist present and a glimpse at how things could be with the right political leadership and governing priorities. During that decade--the high point of America's middle class--unionization was at its peak (a third of American workers were unionized); most workers had stable jobs and wages and the ability to support a family with one income. The federal government invested heavily in education, which generated a marked increase in Americans with degrees; by the late '50s, the U.S. had the best-educated workforce in the world. And Republican Dwight Eisenhower kept tax rates on the richest Americans at 91%. The 1% did fine, but so did most other Americans. How times have changed. direct and aggressive role the Republican Party and its benefactors have played in magnifying all of the ugly trends identified in the movie. The film mentions that UC-Berkeley, where Reich teaches, had free tuition in the '60s, tuition of just $700 (in today's dollars) in the '70s, and now has tuition of $15,000 for in-state students. This fact is wheeled out, but the reasons for the skyrocketing tuition (decades of cuts to education spending initiated by state and federal Republican politicians and activists) go unmentioned. 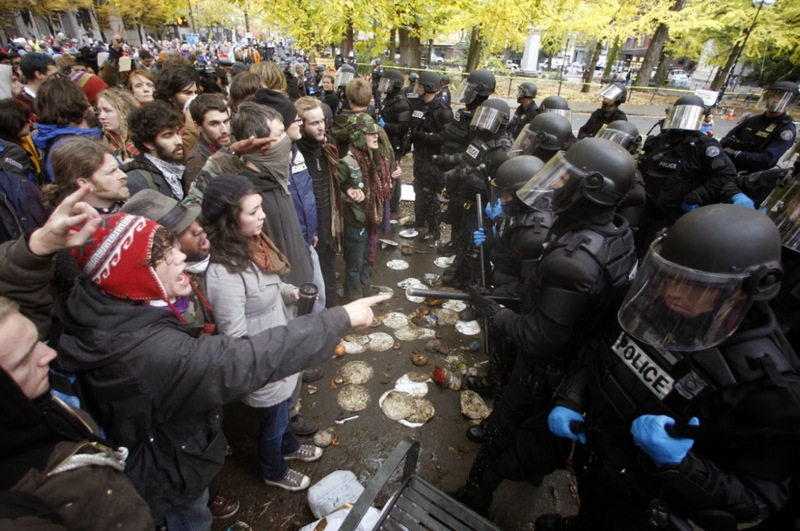 The effect of inequality and economic stagnation on social polarization--as reflected by Occupy on the left and the Tea Party on the right--comes up, but no contrast is drawn between these movements. The viewer could easily presume that both are grassroots in nature, with equally valid grievances. No attempt is made to explain how the corporate-funded Tea Party has benefited some of the very same economic elites who contributed to the 2008 crash and continue to make working Americans' lives so difficult. Due to an insistence on being non-threatening to a broad audience, "Inequality for All" leaves us short of realistic political strategies for reducing economic inequality. 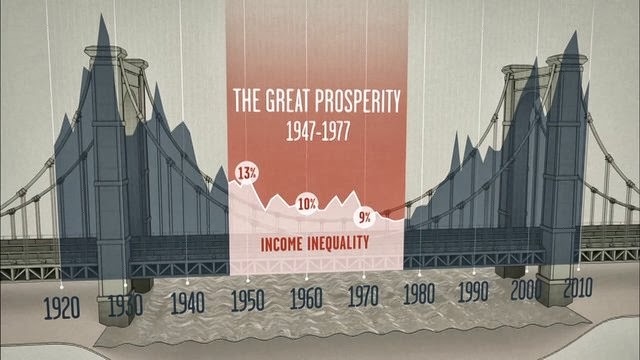 While explaining how floods of campaign cash, low tax rates on the wealthy, austerity policies, and the disintegration of unions have driven economic inequality to record highs, the filmmakers fail to provide the simple and essential context that one party and one side of the political spectrum are overwhelmingly to blame for these developments and show no signs of reversing course. Lacking a diagnosis of the cancer that ravages our political system, "Inequality" offers no clear prescription for curing what ails us. change is hard to come by in the United States due to checks and balances and entrenched interests, but dark (or just plain uneventful) stretches of American history have been interrupted every few decades by periods of reform, from the Progressive era to the '30s to the '60s to January 1, 2014, when the United States will take the first step toward universal healthcare coverage. As Winston Churchill said, "Americans always do the right thing eventually - after they've exhausted all other possibilities."